Find out how myeloma is diagnosed, including what types of tests are involved, and get more information on prognosis and life expectancy. Being diagnosed with myeloma can make an already difficult situation even more confusing and scary. You might feel overwhelmed, numb, fearful, angry or frustrated. Or it might come as a relief that you finally have an answer to why you’ve felt so unwell for so long. All of these feelings are common and are a natural part of coming to terms with a diagnosis. Remember, our team of Myeloma Information Specialists are always here to talk. Find out more in our Help & support section. Usually, when myeloma is suspected, you’ll be referred to a haematologist – a hospital doctor who specialises in the study of blood and blood-related disorders. The doctor will arrange for some tests and investigations to find out if you do have myeloma. As myeloma can thin or erode the bones, imaging tests can be important, particularly at diagnosis. A skeletal survey is a series of X-rays of the long bones, spine and the skull, to detect evidence of bone damage. More advanced imaging tests include magnetic resonance imaging (MRI) or computerised tomography (CT) scans. These scans can provide more detail and identify areas of bone damage which are not so easily detected by X-ray. This involves taking a small sample (known as a biopsy) of the bone marrow, usually from the back of the hip bone. The sample is examined under a microscope. Normal bone marrow contains less than five per cent normal plasma cells. Myeloma patients may have between 10-90 per cent abnormal plasma cells. If your diagnosis is confirmed, some of these tests will be repeated regularly to monitor your myeloma over time. 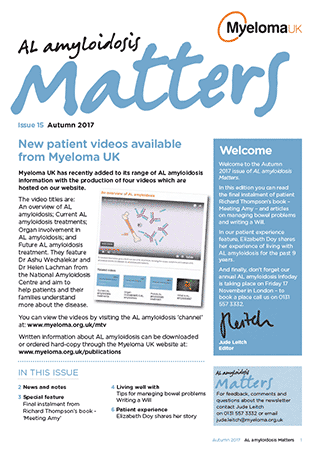 We are working on projects aiming to reduce time to diagnosis and we strive to increase awareness of the early signs and symptoms of myeloma, by educating GPs and other healthcare professionals. Find out about our Early Diagnosis Programme and the Myeloma UK Early Diagnosis Steering Committee. Myeloma is highly treatable in the majority of patients. Unfortunately, though, it is currently an incurable (terminal) cancer. There are many different factors that will affect how long a patient is likely to live. According to the most recent statistics available, just over half (50 per cent) of myeloma patients in England will live for at least five years and a third (33 per cent) will live for at least 10 years. It’s important to bear in mind these are only average figures. 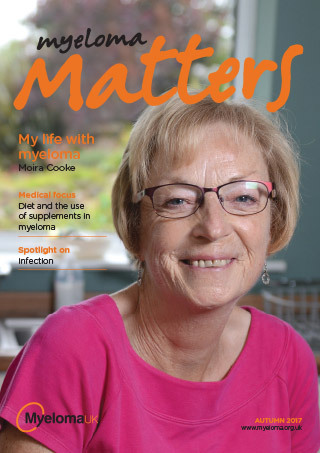 It can be difficult, if not impossible, to predict how long someone is likely to live with myeloma.